Utility vehicles just attract riders. From grandkids to construction crews, folks love exploring the outdoors in a high-powered, go-almost-anywhere UTV. As fun as utility vehicles can be, commercial applications are giving these all-terrain mini trucks a reputation for hard work as well. Professional-grade UTVs can carry heavy spoils, pull implements, power front-end attachments and/or morph into customized work vehicles that can work in diverse off-roading markets such as landscape and construction to fire and entertainment. Sometimes simply transporting lots of people is just as important as working hard, so that’s when you call in a few multi-row utility vehicles. From rental lots to forest-bound logging sites, contractors are looking for utility vehicles that can pull double-duty, both as an equipment and material mover and a personnel transporter. Some can even convert from a bigger bed to more seating and back again. It’s all about keeping productivity high from sunup to sundown, and brands from Kubota and Cushman to John Deere and Kioti are answering that call. It’s pushed two-row UTVs to about 25 percent of commercial market sales. Multi-seating can be the best of both worlds for contractors needing to get a group of workers to a location on the jobsite quickly while still requiring that power and payload expected from a vehicle. 2. Where do you need to travel? 3. How many people do you need to carry? If moving lots of people is top of the list, each brand on the market (from Bobcat to Club Car) will usually offer a multi-row option, sporting bucket seats for four or bench seating for six. The majority of these units have dedicated seating, but a few manufacturers (like Kubota and Kawasaki) are pushing conversion units where seats fold up and down to add or take away bed space. Of course cargo capacity will suffer when converting from large to small (from 1,102 to 661 lbs) on the RTV-X1140, but its versatility more than makes up for it. In contrast, the cargo capacity on a dedicated two-row UTV is often the same as its one-row variant. 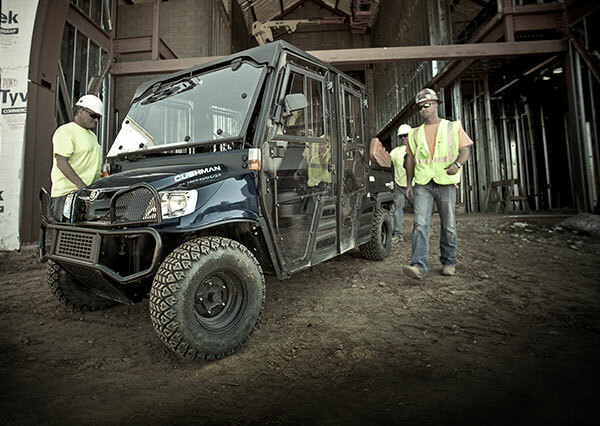 For instance, a Bobcat 3400XL gas model boasts a cargo capacity of 1,250 lbs with two rows of seats. John Deere also notes this. “Because of the design of the John Deere multi-row models, there is no difference in carrying capacity from the single-row UTVs,” explains Lund. John Deere doesn’t technically offer a conversion UTV, but its four models do allow for the back seating to be converted into more storage space (a flat surface for extra payload; see photo above). Deere units range from the XUV560 S4 (a great value machine) to the XUV590i S4 (boasting a 32-hp engine and top speeds of over 45 mph). 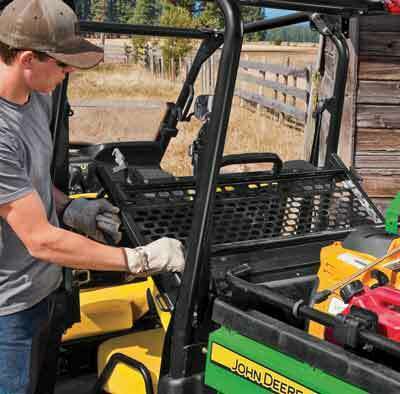 John Deere doesn’t technically offer a conversion UTV, but all four of the John Deere multi-row vehicles allow for the back seating to be converted into more storage space. Compared to some tool carriers like skid steers and excavators, utility vehicles might seem a little simpler and less diverse. Luckily with the right accessories, UTVs can be outfitted to add cost savings and versatility for passengers and projects. But before seeking these options, ensure that integrity is built into the basic design. Focus on products that combine rugged construction, gritty performance, ultra-smooth ride and feel-good amenities. Look for strong frames and rust-proofing, which ensure long-term durability. A standard ROPS, certified to meet five international standards, should provide safety and peace of mind. Standard, retractable seatbelts should be designed to stay clean, away from dirty ground. Look at the cab, console and floor. “Larger space in the operator area, for example, allows crews to enter and exit the vehicle more easily,” says Honsaker. Consider anti-slip, diamond-tread floor boards to provide additional safety in rainy or muddy conditions. For construction or ag applications, definitely get four-wheel, hydraulic disc brakes, which provide excellent response. Then compare things like bed specs. The multi-row Mechron 2240 is powered by a 22-hp Daedong diesel engine and continuously variable transmission. This unit has 1,300 lbs of towing, 1,325 lbs of payload capacity and comes with an optional hydraulic dump kit. The 2240 is also four-wheel drive, just like most of the market compared to two-wheel drive units sold. The Mechron 2240 is also diesel. While gas is still more popular in UTVs overall, diesel engines are still a must for equipment-owning construction contractors. Besides engines and four-wheel drive, there are a number of big options to consider. Think about operator and passenger comfort with options such as a stereo kit, Bluetooth speakers, cab heater or hydraulic dump. Think overall functionality and choose items like a winch, tool rack or trailer hitch, and don’t forget about protection and safety, which includes accessories like windshields, enclosed cabs and bumpers. “With thousands of ways to configure your machine, your dealer can help you identify your intended uses and build the perfect machine for your applications,” says Lund. Other options can include: strobe lights; hard cabs; bed liners; turf or mud tires; skid plates; rear screens; fog lights; side mirrors; and choice of color. Attachments are becoming a bigger part of that versatile equation too. Every manufacturer’s attachment system seems to differ a little bit (so there’s no interchanging between brands), but companies like Kubota and Bobcat are offering some interesting work implements for the front and rear of the machine. And while the vehicle footprint of a two-passenger vehicle lends itself to being more agile with attachments, these implements can also be used on multi-row units too. With UTVs becoming more commonplace on the jobsite, more accessories are being developed to make a wide variety of jobs easier. Multi-seating utility vehicles can be outfitted with almost all of the same accessories as a traditional two-seater UTV. Our best advice is to treat your two-row UTV purchase like you do your car. The Cushman Hauler 4×4 Diesel Crew is equipped with a 22-hp, 1,007-cc, three-cylinder diesel engine, user-selectable four-wheel drive, four-wheel independent suspension and a large cargo bed. This vehicle is built to work and carry people.